Greater Cincinnati’s 10 Most Anticipated Development Projects: just getting caught up on all the news, since I was out of town last week. 90-year-old Florida Man Faces 60 Days in Jail for Feeding the Homeless: WTF, Fort Lauderdale? Slow Cab Coming: a new speed limit for NYC. The Architecture of Change: Building a Better World: interesting new book about social engagement and architecture. You Can Buy This Abandoned CT Town For Less Than A Brooklyn Apartment: the quaint town of Johnsonville has a starting bid of $800,000. 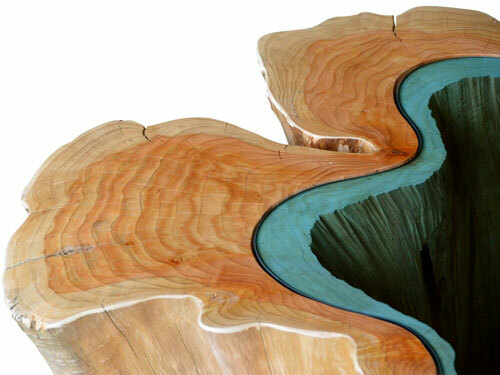 Greg Klassen is a furniture designer whose work is inspired by the Nooksack River, which runs past his Pacific Northwest studio. River-like glass is embedded in between salvaged wood edges that are aligned to mimic topographic forms. Check Out Cincinnati’s New Cool: #hottestcityinamerica. How Segregated Is New York City? : you can probably guess the answer to this question. Escape from New York: Why Some Have Put the City Behind Them: interesting expat stories. The Accidental Revelations of Sanborn Maps: and they’re pretty, too. AHHA Artist Creating Panorama of Mother Road: artist Jessica Harvey is documenting Route 66. Here’s Why No One Shoots Engagement Photos in the Suburbs: hilarious! Art After Dark: Drive-In Movie: tonight at the Cincinnati Art Museum, a free screening of Hilltop Stories, an excellent series of shorts about current and past Walnut Hills residents. Who Needs Red Bike? : just some questions about Cincinnati’s new bike rental program. Jen and Paul’s One Stop Shopping Souvenir City and Chelsea Bus Tours: if you’re a fan of contemporary art, please check this out. WalkNYC: a system of freestanding signs showcasing maps and local information. Half of the United States Lives in These Counties: only 146 counties, in fact. Mapbox Studio: design your own maps. Simple Space – On-Demand Space for Pop-Up Events: a fundraising campaign for an interesting Over-the-Rhine initiative. A Visit to Ohio State Reformatory: tons of creepy photos of a site in Mansfield where Shawshank Redemption was filmed. Stop Using ‘Brooklyn’ to Mean Hipster Neighborhoods: please and thank you. Peering into the Secret, Spooky World of the Stasi: and what an efficiently Modern world it was. Yes, You Can Vacation in These Celebrity Homes: from Orson Welles to Iggy Pop. Map Shows What Each Country’s Military Camouflage Pattern Looks Like: just that.